Let me begin by thanking the My Brother’s Keeper organization for inviting me to speak to all of you this evening. I’d also like to thank St. Charles for having the fortitude to host such an organization and event. Finally, I’d like to extend thanks directly to Charles Wallace-Thomas IV for inviting me here tonight. I met him last year at a library workshop and, because of his demeanor and gravitas, assumed he was an employee instead of a teenage volunteer. It is my singular honor to be here at his behest, and it is my sincere hope that I do not embarrass him. That said, if I were doing half of the things he’s doing when I was his age, I wouldn’t have to take all of the selfies I’ll be taking when this is over, evidence for my mother that I was, in fact, worth the trouble. My subject tonight is “Black Art in Columbus.” That sounds pretty straightforward. But then I considered what, really, is the goal here? Is it to prove that Columbus has Black art? I scarcely think anyone here needs proof of that. Is the goal to point to where the Black art can be found in Columbus? While such information could certainly be useful, there are far better, more efficient ways to glean and retain that information. Any website calendar could fulfill that purpose. Even if some of us assumed that was the goal of this presentation, surely you’d agree that a speech is a poor way to address such a need. Something else we could be doing with our time tonight is attempting to interrogate the value of local Black art, if any such value exists, and perhaps instill that value if we discover it exists. We are, in fact, surrounded by it tonight, so it must have some value. And unpacking such value would almost certainly present us with any number of opportunities to individually reflect on our relationship with not only the art, but the people behind the art, and the ways in which we do or do not apply this information to improving our corners of our shared reality. I think that goal not only has merit, but is vastly under-discussed. So let’s inspect those values and those people, and conversely all people in Columbus. Let us explore this Black art and its value from both sides of the canvas. As of 2014 Columbus has approximately 836,000 people living in it…a 6% increase in 4 years. Columbus is growing, and fast. Something like 10,000 people per year right now. The median age in Columbus is 32. The population is split almost 50/50 between residents identifying as male or female. Columbus has long been heralded as the perfect textbook market city for American values, economic demographics, and political leanings. Considering our current political climate, that should give all of us great pause. Anyhow, back to Black people: In 2010 Columbus was 40% non-white. 28% of that number was Black…more than double the statewide representation of 12%. Which begs the question: Does Columbus seem 40% non-white to you? Do the arts in Columbus reflect the culture of 40% of its residents that aren’t of European descent? Do the politics and businesses seem 40% diverse? Does it even feel that way in February, when we have collectively decided to recognize Black contributions as a community? Probably not, seeing as how only 16% of the business in Columbus was Black-owned in 2007, which was still three times the percentage of Black-owned firms for the state. In short, Columbus has a lot of Black people, has very little Black business by comparison, and both of these stats are head and shoulders over the state average. This information is important because we need to be aware of the conditions under which such art exists, including who gets to do the valuations. It would be remiss of me to not mention that Columbus has a Black art wall now. Well, technically, the newly built Long Street Bridge divides that space between Black art and local luminaries of all stripes, but for our purposes tonight it’s a Black art wall. Once you count the occasional Aminah Robinson exhibit and the random Walt “Wali” Neil mural up and down Livingston Avenue, or the ones painted by Abraxas along Long Street, it’s not like local Black art has a lot of shelf space. Now, don’t get me wrong: the Long Street Bridge is beautiful. It is a powerful testimony. It is earnest. And it is historical. And yet, it’s the history part that concerns me, because it is history. And history can’t really affect you; only its interpretation has that potential. And art needs to be able to affect an audience to have any relevancy at all. If it cannot be accessed, it can have no effect. And if it only receives the highest form of recognition after its prime or existence, it has virtually no effect. To celebrate the artist and not the work is backwards and pointless. Other questions the wall raises are: who will be on the opposite side of the freeway? Where will they come from? The community knows they exist on some level, but how will the gatekeepers be made aware of who brought this city to life yesterday, who gave it culture tomorrow, who extended our collective cultural breath? Art is not static because life is not static. No culture has ever existed on this planet that has not sought to capture some aspect of their lives through art. Perhaps the bridge is a gateway, except that gateways open into spaces, or protect spaces from people who don’t belong in them. The Long Street Bridge isn’t doing anything remotely this nefarious. It is neither rolling out a red carpet toward anything (yet) nor is it preserving space, so much as spaces that used to be. As historical records go, it’s being asked to do far more than its fair share. How many galleries showcase the work of the artists on the wall? How many libraries have archived their output? Where can one find the routines of its dancers, the writings and plays of its authors, the music of its long-dead eras? Is the wall the city’s Black record of choice? History is only history for as long as someone can engage it, can find it, can access its lessons and values. If I cannot find the work of the artists on the wall, is the wall where the history ends? Is the wall a testimony or a tombstone? The people depicted on those panels deserve every ounce of recognition that can be mustered on their behalf. But where do I access the work of the people on the wall? Where do I go to see Kojo Kamau’s photographs or the music catalog of Capsoul Records or the rap group SPIRIT? How many Aminah Robinsons will I never see because if we don’t rate with the Columbus Museum of Art, you will never hear of us? How many people on the wall are still alive to affect change, and if they are, in what venue? Should they not reign over their respective art scenes in this town? Shouldn’t it be easy to find them and the people who have followed in their footsteps performing in this town? Shouldn’t I be tripping over the work of Black painters and visual artists within a mile of that bridge? There are almost a million people in this town, and yet there is no definable Black art enclave. White artists build art compounds and festivals almost as a matter of course. It is a development so common, so formulaic, so normalized that an artists’ enclave or pop-up is the textbook signal that an area is about to be gentrified. Hello, Franklinton Arts District. Haven’t seen you in years, not since you were the Short North Arts District. These developments are important to the subject on the table. All of this devaluation teaches communities how to disengage from local art scenes. Comfort is an American value. And Columbus – being the test market city that it has been for generations – reflects that more than most cities. Columbus is orderly if nothing else. It likes its boxes. It used to be said of Columbus that, as cities go, we were urban-light; we had everything a real city had, but we only had one of it. While that’s far from true in a lot of areas these days, Columbus still sees itself this way. And when it finds a box to put something in, it doesn‘t bother to look much further. Columbus has its creative institutions, its gatekeepers of the arts that get noticed and funded. It is the same art, artists and organizations that show up in most magazine articles or newspaper spreads, the ones that the city is content to know. And yet culture – vibrant, breathing, sometimes profitable culture – requires the fullest range of access that can be provided. Genuinely supported and deep ranging arts scenes contribute to a city’s tourism, educational productivity, quality of life, social interaction, collective memory, property value, political literacy, cultural diversity, and socio-political tolerance. The arts not only contribute to these things; in many instances it generates these values, sometimes out of whole cloth and frequently where a vacuum has existed. I’ve been to Austin, Texas a number of times over the last fifteen years. The thing that stuck out to me each time I’ve been there was not the heat (which is, shall we say, memorable). It was the fact that everywhere I went had a performance space. Every coffeeshop had a stage or a black box theater in the back. Every bar. Every restaurant. Every barbecue joint. Even the airport puts on live performances. Anywhere a performance space can be created, it is. Austin is regularly touted as one of the most vibrant cultural hubs in the country. People and businesses flock to it, not for its food or the number of restaurant chains it contains or its low cost of living. They flock to it because it has a pulse, because it emits a sense of The New, because it nurtures artistic innovation. It has an inexhaustible respect for art. If a city could hunger for art, Austin hungers. In 2010 Columbus and Austin had almost the same number of people, with a difference of about 20,000 in Austin’s favor. Five years later that difference has exploded to 76,000. Bear in mind, this is a city whose largest export is the impression that it is perennially cool. That it not only has culture, but breeds art as a civic value. When people say an area or a city is “static” or “dull” or “suburban” they often mean it lacks culture. A city without culture lacks surprise, lacks individuality and uniqueness, lacks engagement. Food is often delicious but rarely rises to the occasion of art. Shopping can be challenging, but is not an art form. Consumerism should be a tool, not a goal, and yet the opposite is installed at every turn. Poor people are run out of their homes or allowed to languish. Blight spreads. Developers ransack what was once thriving, and redevelopment is born. Columbus is so keen to develop that it frequently destroys the very thing it needs to generate to have it seen as a “real city” on the world stage: culture. The funky art gallery or the theater space doubling as a coffeeshop is leased out of existence to make way for progress. The festivals that tout support of local artists wax and wane in how ardent that support is. Almost none of these exercises pay artists. And how many broken drumsticks can one replace with exposure? How much canvas can word of mouth buy? For some individual artists such opportunities can be a good thing, but for whole segments of local art these avenues could be doing much better: better stages, better treatment of the artists, a more concentrated effort to give them the shine that they deserve, to be treated like the valued commodity that they obviously are, not as an invited nuisance. Exposure doesn’t pay off in more ways than one when the avenue for the exposure is low-budget or ill-supported or shuffled down the priority list. Columbus has Black art coming out of its ears. This city has Black artists practicing their craft in almost every category of art we have a name for. What it does not have is a clear and present value for art weaved into the fabric of our local culture. This is not to say that what few institutions and avenues exist work against the Black artist in a concerted effort. But much of what arts councils and venues and platforms have to offer rely on who-you-know networks instead of direct and meaningful outreach. When you live in a community that caters to your values, your values become the norm. And artists and audiences who do not conform to the normative structure – either in what they create, where they live, or where and how they access information – are not sought out, embraced or recognized in any great number. Minority artists frequently do not feel welcome in spaces if they are made aware of avenues at all. And trust me when I say that it is the rare Black artist who is genuinely content with being a token effort. There has always been a huge wall of silent misinformation between the mainstream cultural world of Columbus and its various Black arts scenes; a wall which, in reality is not so tall as to be insurmountable and could ultimately be dismantled by education on both sides. That’s the largest barrier to the proliferation and value adjustment of minority art of any stripe: misinformation. There are bright spots here and there where people and institutions seem to get it, where genuine celebration and quality engagement with minority art occurs. But the question of access is huge, mostly because audiences place so much value on what appears in the places that endow access. As a publishing poet, it doesn’t go unnoticed that the majority of awards, accolades and publishing lean into the academic base. There is an inherent value attached to a poet who associates with the academic world, and that’s before I start counting how many of the avenues they may be published with or rewarded by are university based. I hate to be the one to break it to you as if you didn’t know, but the majority of Black artists in Columbus and abroad don’t have the luxury of going to college to study their art. It can be hard to justify those kind of academic tracks when you’re Black in America. Mind you, this doesn’t mean they’re not good artists. I’m a decent poet and I was expelled from Ohio State University after two quarters. Part of the reason I was expelled was because there was no way in the world my mother was going to pay to send me to college to write. For the first time in my life I was in the best place in the world I could be to learn how to do something I loved, yet not allowed to access it in any productive way long term or formally. I was compelled to dedicate my life to doing something I did not love to live, to survive. None of that is a criticism of my mother. Almost every parent in here would have done the same thing if their child came to them and said “I want you to go into thousands of dollars in debt so that I can learn about poetry.” It is not a criticism at all. I’m simply drawing out some of the origins of some of the issues we see now. If I had been able to access the art earlier, in places and ways that made me feel valued and suggested I had something to offer, and then allowed me to offer them, I might have had a different college conversation with my mother. 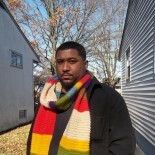 A good friend of mine, Dr. Mark Lomax II, is a jazz musician and composer. He was raised in his tradition. He was an incredible drummer by the age of 19. Going to college was a refinement of what he already possessed not only naturally, but intellectually. I often wonder what it would take to create a generation of Marks, children able to catch on early to something they loved and could engage their art at a certain level, what things they might have to see to figure it out before they got to college. Whatever that action would take seems so close to me in Columbus. We’re so close to figuring that out that I can taste it. It’s not just a call for more youth programming. Columbus is brimming with youth programming. It is not, however, brimming with opportunities once one is not a youth, and it is as important for up and coming artists of all ages to not only find spaces that will allow them to engage with art, but see opportunities for that art as a communal priority, as a job, as a trade, as a means to create change. they don’t have to contend with the white gaze as a patron or an artist. And because white audiences hardly deign to enter Black establishments to access art, they don’t. And who can blame them? White audiences aren’t hurting for quality platforms to experience art that reflects their values and culture. In fact it can be argued that almost every venue of quality in Columbus exists for the sole purpose of presenting white art and values. Certainly every venue of note. It’s times like these when the non-normative venues get a shot for people’s attention, and good luck retaining that between Black History Months. Avenues do exist to institutionalize local art. Artist databases do exist. Grants exist. There is a significant education piece here that is sorely lacking, and it should be the responsibility of those institutions to commit to the kind of outreach that will diversify their base, not wait for artists to catch on between struggles. Classes exist to train artists. Workshops exist to refine artists. Minorities are starving for representations of themselves in the culture around them, and yet somehow these dots are not being connected. For the last few years or so this city has had approximately 100 practicing poets at various open mics per week. Of that number, no small portion of them are people of color and a significant portion of them are women. There is a poetry event happening almost 7 days a week in this town, and some nights have two. Imagine all of the cultural and ideological exchange happening in those mostly free, totally accessible spaces. And that’s just the poets. Just imagine what’s happening in the art forms you actually care about. With the long history of Columbus hip-hop, a decades-long love/hate relationship with jazz, and some serious combining between genres in R&B sectors of the city, the number of Black musicians in this town is incalculable. The visual artists work in just about every style and are spread out all over the city, vying for too few opportunities. The diversity of the arts in Columbus is astounding and yet, one would be hard pressed to discover where it could be found at all. If you have no arts districts, or only high end venues, or artists cannot afford your space, or art isn’t a priority for you as an individual or an institution, your city is only capable of generating certain levels of culture. Again, Columbus has hundreds of Black artists spread across the spectrum of art with nowhere to go, too few ways to seed and develop their art, and virtually no way to build support in the real world. They tend to tackle these obstacles by combining forces – say, a showcase that features music, visual arts and poetry – but these shows cost money that they don’t often make back. Culture needs space so that it can generate support. And it needs support so that it can be free to generate more and better art. And yet at the current rate of awareness and support, Columbus is well on its way to becoming the 2016 Oscars. The King Arts Complex should either present art of all kinds in its multiple, massive spaces on an ongoing and regular basis until it bursts at the seams, or it should remove the word “art” from its title altogether. While there has been an uptick in its presentations and displays in recent years, these are recent developments and hardly reflective of the Black arts scene of the city in that same amount of time. For over two decades the largest, Blackest space in town priced themselves out of much of the indie art market and garnered a reputation as being inaccessible and too expensive for up-and-coming artists to use. It should be the linchpin of the King/Lincoln District in more than concept and property value. It should look like Beale Street, sound like the French Quarter, or just shoot for the Mount Vernon Avenue of 1945. It should be humming with outreach and creative activity. It should be incubating Black artists with studio spaces. It should have performances and exhibits by working, living Black artists as a matter of course. Concerts should be the order of the day. It should be its own street fair. The King Arts Complex could host a different band, concert, workshop, arts lecture, open mic, art exhibit, play, or dance recital every day for a year just using local Black talent, most of whom would come cheap or free to be a part of building such a resource. Imagine the city-wide campaign that could be built around a venue that promises 365 days of unique Black art. I have driven out of state for far less. By now you are thinking, “Gee, Scott, you sound really critical.” This is not a coincidence. For once, criticism isn’t part of the problem. We must develop critical lives. Why? Because we live in critical times. When you feel you have to exclaim to the world that your life matters – and not in the abstract – you live in a critical time. When you live in the supposedly greatest developed nation on Earth in the history of mankind and you fear the people who are hired to protect you, you live in a critical time. When the world can watch a town filled with poor and Black people strangled by their water, you live in a critical time. Critical times require critical lives, and not just critical minds. Critical minds should lead to critical lives, lives seeking not only the Achilles’ heel in every news story and microaggression for comment, but to place hands upon a problem, to readjust the lens through which the world sees your skin, and its value, if that is all it will see. In this light, critics are necessary. They always have been, but never more than now. Access breeds creativity. Culture breeds creativity. Freedom breeds creativity. Space breeds creativity. Black art is here and it’s growing exponentially, but it’s not penetrating. As someone who creates and benefits from Black art every day, I’m telling those of you who don’t that you’re missing out. There is an unrealized and great city where these roads meet. Black artists are founding art societies. We will create dedicated art rooms, libraries and collections. We will unlock your pop-up business model. We will fight for venues and co-op spaces that seek to support us. And we will conquer the accessibility vacuum of both information and entry. It is what we have always done, but we do not always remember. Sometimes we get distracted. Sometimes we give up and lose some along the way. And yet, here we are, on the cusp of a renaissance. I encourage any and all people who love the arts or Columbus to get on board. Reach out to the artists and ask what they need. Help them figure out the way. But know that either way, we’re not going anywhere. We’re used to fighting. It is all we know. We’ve been building underneath the radar of Columbus development, upper class exceptionalism, and market-based value systems the entire time. Eventually there will be nowhere else for us to go but up. This entry was posted on February 2, 2016 by SWoods in Art, Columbus, Speech and tagged African American, Art, Columbus Ohio, Long Street Bridge.